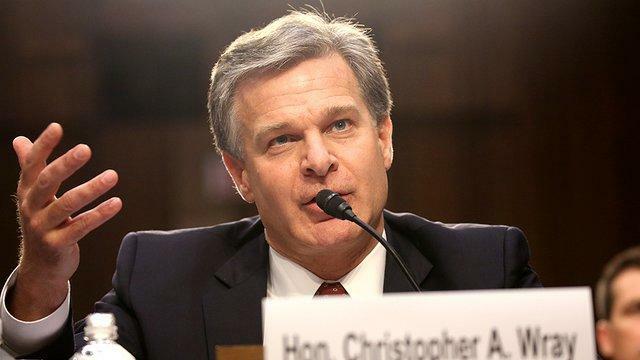 Federal Bureau of Investigation Director Chris Wray declined to answer a question as to whether the FBI or the National Security Agency is currently collecting the phone conversations of President Donald Trump. It’s been reported in the Washington Post about two years ago there were 1,500 times when the president–this is when Obama was president–was minimized meaning that, yes, you are gathering up so much information–you, the NSA, the intelligence community–that actually the president’s conversations are caught up in there. Do you think it’s possible that Congress–that members of Congress are in the FISA database if we talk to international leaders? “Well, senator, I am quite confident that we are conducting ourselves in a manner consistent with the law and the Constitution that’s subject to extensive oversight,” he said. Paul then asked Wray whether journalists’ conversations were being possibly being scooped up by the intelligence community’s vast spying apparatus simply because they write stories about people with “terrorist name[s]” in them. Paul then widened the question to include international business people–asking whether their conversations have ever been swept up in the FISA dragnet. Wray again demurred. You’ve had people bringing their politics to work. The concern of us who want more control over what you do and how you look at data is, as Madison said, ‘men are not angels,’ that’s why we have the Constitution. That’s why we ask you to get a warrant. The information you’ve gathered in the foreign database is not constitutional in the sense that it’s gathered with no bar, there is no warrant, there is no constitutional matter to that data. And yet, you’re going to then use it on domestic crime. That has been our complaint for years and years and years.